I’ve read and re-read your comments on Monday’s post about my dining room and pantry space planning, and I’ve finally come to a decision. I almost kept it to myself and waited until I actually started working on it to share my decision with you, but I’m way too excited to keep it to myself!! I think you’ll be surprised. I was! It’s completely different from anything that I’ve considered in the past. Y’all had so many great ideas, and I really did read and consider almost every suggestion. The only ones I didn’t even consider at all were the ones suggesting that we use the music room as the dining room. I really wasn’t joking when I said that option would not work for us. Here’s how our house looks right now. If I put a dining table surrounded by large upholstered dining chairs in the middle of a room that’s right smack dab in the middle of our house, and that’s just over 10 feet wide, that would make it impossible for Matt to easily get through that room to get to the kitchen or sunroom. Designing a house that is both beautiful and useful for a person in a wheelchair requires some different thought processes than most homes require, and my goal is to make life a little easier for him. I don’t want to end up with rooms filled with obstacles that make maneuvering around his own home incredibly challenging for him. So that room really needs to stay open in the middle, which is why it’s perfect for a music room. My upright piano can go against one wall, and I can put a little seating area (two chairs and a side table) on the other wall, and leave the middle wide open for him to get through easily. That picture really got my wheels turning because many of you said that walking from the garage through two doors would be a pain, but I thought that I could make the actual entry/garage door be the one from the garage to the (now) storage room, and then I could turn the storage room into a mud room with a cased opening (no actual door) into the back of the dining room by the new built-ins. That way, I’d just have to contend with one door as I bring in groceries. And the freezer could go in the mud room. An entire wall of cabinets would be so much more expensive than what I had originally planned and wanted — open shelving inside a room behind a door that can be closed, where I can store dry goods, appliances I don’t use every day, a broom and mop, etc. Do I really want/need more cabinet-style storage? That type of storage doesn’t seem as easy and efficient as open shelving where I can easily store and get to large, heavy appliances, like our Champion juicer and other things I use only occasionally. As much as it made sense, I really don’t want to move the garage door/entry into that part of our home. It’s really very convenient to have a door that goes directly from the garage and is a straight shot right into the kitchen. The other way — door into a mud room and through the back of the dining room — felt kind of like a maze. Do I really need a mud room? Nope. Quite honestly, that would be a room that’s more for pretty blog pictures and fun for me to design, rather than useful and practical. We’re in Texas. We really have no need for a mud room. What I desperately need is organized storage for all of my tools, so the storage room really needs to remain a useful part of the garage where I’ll eventually have my workshop. So those questions and thoughts really got me to thinking. Plus, so many of you asked great questions that really made me stop and think, in practical terms, just how I wanted to use that area of our home. My priorities are:. Not necessarily for formal dining, but a place where Matt and I can eat all of our meals, which means it will be in use three times a day. A comfortable place where I can work at the table on my laptop and enjoy the sunlight that pours through the front windows. I want to keep the door into the garage right where it is. The idea of it opening right into a dining room has really bothered me, but it’s convenient and practical, both for me and Matt, so it really needs to stay. I want a walk-in pantry. As much as I tried to get on board with more of a butler’s pantry with nice cabinetry, it’s just not what I want, and it’s not as efficient for what I want to use it for. And then came the question that MANY of you have asked over the last few months, and when I really stopped and thought about it, it changed the whole course of my space planning. Do I really need a front living room and a family room? I’ve wanted both from the beginning, and it has just been engrained in my mind that that’s the way it was going to be. My mom has both a formal living room and a family room, and it was always so convenient and practical for her. But the reason it worked for her was because she was self-employed (professional photography and photo restoration) and worked with clients, so when they would drop by the house, she would meet with them in the living room. No matter what we had going on in the family room, and no matter what messes we had made, the living room was always very clean and inviting. In my mind, I wanted that same thing — a place to visit with people who just happened to drop by unannounced, and a place that would always stay (relatively) clean no matter what messes we had going on in the family room. But in the 17 months that we’ve lived here, the only people who have dropped by unannounced are door-to-door salesmen and Jehovah’s Witnesses. I have absolutely nothing against either door-to-door salesmen or Jehovah’s Witnesses, but I don’t make a habit of inviting them into my home to stay for a visit. Other than that, all of the other people who come over are people who actually know me, and know that I’m working on remodeling my house. So there’s no need to keep them confined to a front formal living room since they’ll want to have a look at my latest projects and progress anyway. These are people who I would naturally invite into my family room, even if it was messy. So no, I don’t need both a formal living room and a family room. What I do need is an informal eating space where Matt and I can enjoy daily meals and as we watch our shows, preferably with a more intimate and comfortable setting with a small-ish table and about four chairs, and then I want a dining area that can seat more people since I do have a large family and will eventually want to host meals at my house. Phew! That’s a lot of words and a lot of explanation all to say…. The new plan is to turn the room by the kitchen into an informal breakfast room, with a large pantry at the back, and then turn the front living room into a formal dining room. I’ll eventually be adding a cased opening from the kitchen into the front room, which will now be the dining room. Since the room to the side of the kitchen is now going to be an informal breakfast room, I have no issue at all with the garage door placement. I’ll be adding a large walk-in pantry at the back of the room with the open shelving storage that I wanted. Since that room will now be a breakfast room and not a dining room, I have no problem at all closing up the doorway from the family room to the breakfast room and making the only access to the breakfast room through the kitchen. Plus, it’s just as easy to access the kitchen via the music room as it is to access it via the breakfast room. That pantry will be large enough to house the freezer that I want, and since it will be off of a breakfast room and not a dining room, that doesn’t seem strange to me at all to have the freezer in there. I get to keep my storage room completely intact and used only for tool storage, which is what I need. At first, I thought the idea of having the dining room right off of the entryway would be strange. I mean, I’ve seen pictures and been in MANY homes where the dining room is just to the left or right of the entryway, but I always seemed to remember that the spaces were separated somehow — a cased opening, or columns, or even different flooring used in the two areas, or just something. Mine won’t have any kind of separation because anything like that would throw off the symmetry of the pony walls and columns. But after looking for some other examples online, I realized that it’s really not all that uncommon to have a wide open dining room, with no separation at all, right off to the left or right of an entryway. It’s not standard, but it’s not completely unheard of either. This is the best example I found. I wish I could see it decorated, but even undecorated, it’s clear that that area is the dining room. Here’s another one, assuming that the picture was taken from the front door. I even found a few examples with the dining room straight ahead when entering the home, with really no separation between the entry and dining room. Come to think of it, this is how my house was originally designed. So I guess the lesson I’ve learned here is that you have to design and use your home in the way that makes the most sense to you and the people living in your home. Sometimes the rules and the original intent of the rooms in your house have to be pushed aside to make things work for your family. For the last 17 months, I’ve been trying to force ideas and designs that made sense in my mind, but didn’t necessarily make practical sense for us. It’s taken me over a year to finally figure it out. And I guess it took me over a year of living in the house and seeing how we actually use the different spaces, but I think this is the plan that will work for us! I’m very excited to turn that front living room into a beautiful and inviting dining room, but I’m even more excited about getting started on our little breakfast room that we’ll be using every single day. Next Post What Would Your Dream Walk-In Pantry Look Like? this looks perfect! I love the way you design to make things work for you & Matt. Functional and beautiful! It can be done! Eager to watch this come to be. I love the new direction. Makes total sense for you and Matt and that is what’s most important, of course! I was excited for you and then, oh no!, all of that time spent on that subway tile installation. Ah well, I guess it’s all about the bigger picture. Thank you so much for sharing the whole thought process! When you live in an older, somewhat oddly configured home, it’s good to take a long hard look at what YOU need. I turned my dining room into a den/tv room, and a wide, little used hallway into my dining room. So like you, I now have a configuration that works for me and the way I am most comfortable! Looks like you’re on the right track, to make your home fit your life, rather than the other way around. Good for you. Wowsers! I didn’t see that coming but it makes perfect sense. For large family gatherings you could even use your hall table as part of a buffet/serving area. Excited!! Kudos! So glad you’ve been able to figure out what will work for you and Matt in this forever nest. After all, shouldn’t our “nests” be comfortable for us? As always, look forward to what you have in store for us! Young House Love successfully converted their “formal” LR into a dining room in their last house: http://www.younghouselove.com/photo-gallery-2/our-current-house/ (scroll down a bit). The Lettered Cottage also has a front door that opens into their Dining Room. It was one big open space, but they are adding a wall to separate the Dining Room from the Living Room, but the front door is on the Dining/Kitchen side. 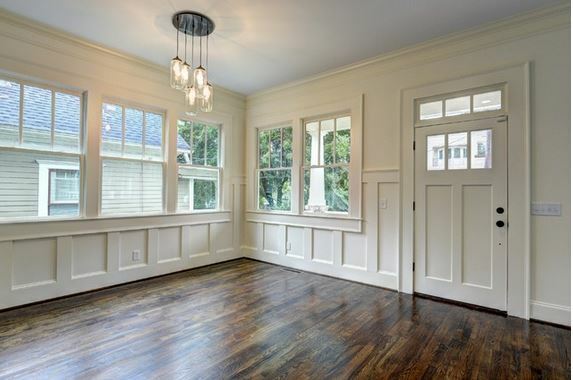 Not sure if it would be too much, but if you did similar doors on your pantry as you have from the music room > family room, you’d still get the light into the breakfast room for that window in the pantry. So does this mean you’ll have to destroy part of your pretty tile wall? I do love the plan though!! I will have to cut a doorway into it, but I think with the right tool, I can do it with no damage to the surrounding tile. And thank goodness subway tile is cheap! I’d cry if I had spent tons of money per square foot for really fancy tile, only to be removing about 21 square feet of it now. I would definitely not cut that opening into the kitchen! You’ll being looking into the kitchen with all the predinner pots and pans from the dining table, and that’s not something conducive to relaxed dining. The door from the kitchen to the music room is close enough to the dining room for easy transport of food, and cutting another opening from the dining room would take out a whole wall that could be used for beautiful art and furniture. Don’t most dining rooms have access directly from the kitchen? Almost every one I’ve seen does. My mom, who is an interior designer, is also very opposed to having guests being able to look into a messy kitchen. We ran into this problem when designing my house. A simple solution (that we didn’t end up using because we were able to change the floorplan) is to have a large “window” with a ledge from the kitchen area to the dining room. It would start above counter height so you wouldn’t be able to see dishes sitting on the counter below it. It would also allow easy transport of food/dishes from kitchen to dining area, which is the main reason most dining areas have a door for kitchen access. AND, you could even keep the painting and hang it above the opening if it’s not too large! Our old house had an open dining room directly to the right of the entryway and then a passage way from the dining room to the kitchen. To be honest, as much as I loved my kitchen I did not like the direct view of it from my front door. In the house we moved into a couple years ago, the dining room is also open to the left of the entryway but I have to go a short distance through a semi-formal living area to go into kitchen (even though they share a wall, like yours do) and I like this SO much better! This neighborhood we’re in now are all custom-built, not spec homes, and I can think of 5 different ones I’ve been in that don’t have direct access from their dining room to kitchen…I think you will find lots of both ways these days. You may have it ingrained it your mind that’s just how it’s done…but if you’re not 100% sure of what YOU want, I would maybe make the doorway the last thing you do. You might find you like the separation or you might not and decide you like the doorway best. I don’t use mine everyday so I don’t find it inconvenient not having direct access. Love the new direction you’re taking…can’t wait to see what you do! Very interesting! t never occurred to me that it would be common for homes to have dining rooms that aren’t right off of the kitchen for easy access. I wish I could see some examples of this in person! Mine doesn’t. It has always been kitchen into living room and living room into dining room. Last fall we moved that kitchen doorway from the south end of the kitchen to the north end of the kitchen to make it “closer” to the dining room but it still opens into the living room. It does function better now for carrying food through to the dinning room but it sure screwed up my kitchen plan! I’ve been trying to sort out the mess I made in doing this for six months now and I still haven’t figured it out. Sigh. You need to not worry about what most homes have and stay with your new understanding of how your home works for you. Ask yourself a few questions. Are you the domestic Queen type who can keep a kitchen spotless while dishing up food for 15-20 people? Is it worth the (small) effort to carry food through the music room, if you’re worried about looking at any mess you may have left? Are you going to be cooking while your guest are seated and want to still be part of the conversation? or Would you be more relaxed knowing that any mess is unseen until you want to deal with it. If your family is anything like mine, there will half a dozen sets of hands to help you carry food, and helpers tend to make more mess. Chances are if your still cooking something they’re going to be in the kitchen right there with you. My preference would be to leave the wall intact, but again it comes back to how you live in your house. It’s really exciting that you’re getting to know your house and how you and Matt use it. Moving the Dining room is a great idea. I’m looking forward to watching the progress again. I always thought that the living room and family room are too much in that you need to decide where you want to hang out 🙂 so I think this is perfect! My only thought is: Where is the beautiful picture of your mom’s going to go? How about on the wall in the new breakfast room as that’s still close enough to the green kitchen it was designed for? anyway, cannot wait to see how you go about it – and I already envy you the pantry now 🙂 no, no, you deserve all that you do (I mean that entirely positive!!) and cannot wait to see how you’ll organise your pantry and everything else! I know…I thought about that! She did that painting specifically for that wall. I WILL find another home for it, and I’m sure she’ll be just fine with me moving it. Perfect! It looks great and will work for the way your family uses your home. I can’t think of anything more perfect. We are moving, but the way I’ve always expected we’d re-do is to have the dining room in what is now our “formal” living room, the current dining room to become part of the kitchen and the family room to be THE living room in the house. How many sitting room areas does a house need? I want as little redundancy as possible. Each room with a unique function. 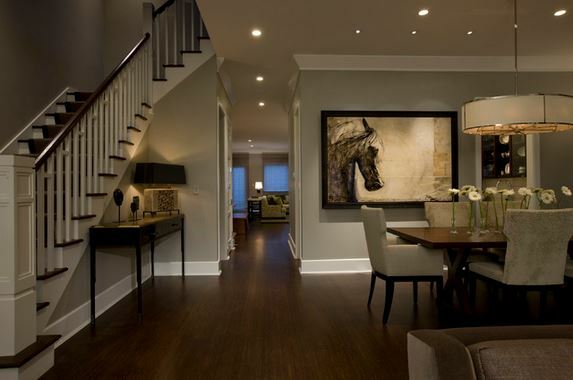 I have been in many “model” homes that have the dining room off the entry and think this layout is so smart! Dining rooms are generally clean and house some of our most elegant collections. Great decision! My question is: your new floor plan has a door into the kitchen. After all of your work on your beautiful kitchen, what will have to be redone to accomplish the new flow? I will have to cut through some of it, but if I use the right tool (a small grinder type of tool) that’s made for cutting tile, I should be able to cut the doorway with no damage to the surrounding tile. I’m just glad I used subway tile! If I have any mishaps, it’ll be cheap to repair. I think there’s a rotary tool bit for it too, but I know how much you hate that tool…. 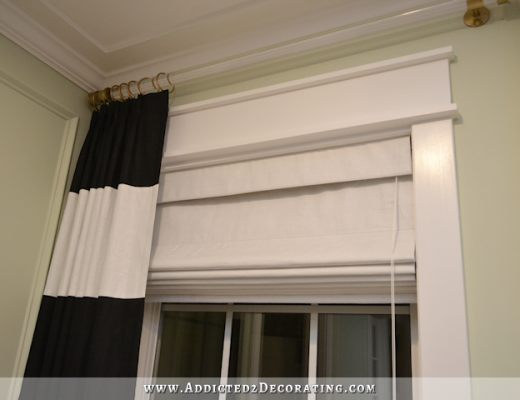 Great site lines to openings (especially windows) and room features. One teeny tiny adjustment perhaps . . . the swing of your office door. Consider matching the swing of other doors; which is into the room (Matt’s, Bedroom, Laundry). If swing interferes with closet access (door), you could switch closets with Matt very easily. I like the option to leave my door open when I’m in my office (studio), how about you? I definitely plan on changing that when I get to the hallway, and start replacing those doors. I’ve always thought it was strange that the door opens out into the hallway. Love it! Make absolute sense that living in the space for a while makes its form and function become clear. And I’ve no doubt that this will result in another bases loaded, out of the park home run! Looking forward to the outcome. I’ve seen many homes where the dining room is at the front near the entry, and especially like the peak into that fabulous kitchen that will be seen through the doorway. Wish I had a tenth of your thought processes in approaching my own space! You have a total winner in my mind!! It not only makes sense for how you live, but I think it makes plenty of sense for resale too. The formal dining could be used for a dining or formal living for a future owner and your new layout with the kitchen makes perfect sense for it to be a dining. Bonus, you don’t have to deal with the sloped ceiling in the pantry either. The garage door into a breakfast area is super common too in most Texas floorplans. The only thing I disagree with you on is the usefulness of a mudroom in Texas. I have one and absolutely love it. Keeps all the shoes (we are no shoes inside for the most part, backpacks, jackets in winter, stuff that we need to take in the morning) stay outside of our living spaces. Keeps it out of sight. It is also our main entrance, but you don’t have kids and I think with kids it is even more useful. Oh forgot to say if you ever feel like you need a formal space the little sitting area you described for your music room seems like it could function for that if need be. Even if you didn’t have to worry about Matt getting around the old dining room in a wheel chair I still don’t think it makes sense to have a dining room there since it is essentially a large access point to so many areas of your house – like a large hallway. A dining table in the middle is just an obstacle there IMO. love the new designs, but OMG, that beautiful tiling in your kitchen, will you be removing it or putting in a hatch or something. Interested to see! Kristi, I think that ‘s a wonderful solution! My one hesitation would be that one would see the kitchen as soon as she came into the entry way. My thought would be to have swinging doors/french doors between the kitchen and dining room to hide the ‘mess’ of the kitchen. My dining is off my entry way (though my house is older….was build in 1959. I love the layout with the dining room in the front. If I lived there, that would be the best lay out for me. We converted our formal dining (it was smaller) into a study and made our formal living the dining room. It is probably my cleanest and most organized room, with the best furniture….maybe gives a better impression of me for those who come over but don’t come it. You’ve put a lot of thought into this Kristi, and kudos to you on your final plan. It makes total sense for yours and Matt’s life and forever home. The part of the plan that surprised me the most, was turning the living room into the formal dining room (due to accessibilty from your kitchen) but when I saw your plan with a new cased entry through your new kitchen subway tiled wall, I thought wow, you have really put a lot of time and thought into this, so I know it will work and be the best plan for you & Matt. Can’t wait to see the transformation on the rooms……it’s very exciting now!! I love it, Kristi! So happy for you! I like the new layout and also an earlier suggestion about a swing door or such from the kitchen into the the new dining area. One more thing, why are you not interested in an upright freezer? Just curious. Actually, after reading everyone’s comments on upright vs chest freezer, I’ve decided that I’ll probably go with the upright. It does seem like it would be easier to organize and find this inside. Upright is absolutely the way to go, for your freezer. Chest types can be organized with baskets, but there’s still the problem of reaching the stuff in the bottom. An upright with plastic baskets is so easy to maintain. I’ve had my upright since 1987, and I would never switch. For those of us that are height challenged an upright freezer is much easier to access. The no mom of a chest freezer can be difficult to reach. I think you final plan looks great and very accommodating for you & Matt. You’ve made me cry! 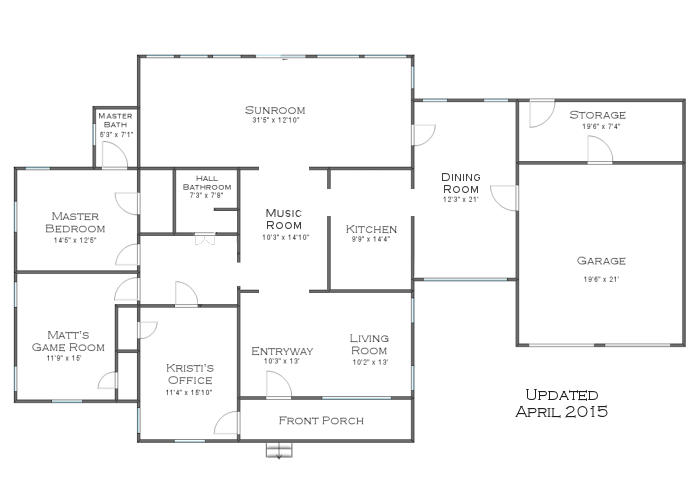 I want your new floor plan so badly! I so much lust for your pantry! I didn’t post yesterday because I was too busy to put my idea into it (getting estimates for a new hvac system and trying to get some money making work done), but you’re doing exactly what I had in mind (and this isn’t the first time *smile*). I think that you and Matt will be very happy with this decision, once completed. People say I think to much or over think, this, and the other decisions you’ve made for this reno, are perfect examples of why I don’t take those comments seriously. So happy you’ve found a solution that works for how you live! Just the tone of the post is much moreitivend sounds “surer” than previous posts about the living room. Excited to see how it all works out! Do you really need a formal dining room? I was totally on board with the way you want a walk-in pantry. But, it sound like it really just you and Matt, so I don’t understand a need for a formal dining room. I must be old school, but I would never put a dining room at the entrances. I’m just being real. I love what you do and can’t wait to read your blog everyday, so please don’t think that I’m a hater. “Formal” isn’t what I need. Bigger is what I need. I have a large family, and want to be able to host them, so I need a smaller, more intimate dining area for Matt and me to use on a daily basis, and then a larger dining area where I can host my family. I have the same question Barb noted above. After you cut a door between the current living room and kitchen, what will the sight line from the front door show? Will you put some kind of sliding door there also? I agree 100% with designing your home to work for your and Matt’s needs. What looks good in magazines and online websites is not always workable for real life. How’s the hall bathroom coming? I probably won’t put a door in. A swinging door would get in the way, and that’s a load-bearing wall, so I don’t really want to mess with a pocket door. The bathroom is coming along. I made some progress yesterday, but things are kind of slow since I don’t have a car right now, and can’t make my daily trips to Home Depot to get things I need to finish up projects. Whatever moats your goat, honey! If it works for y’all and brings ya joy, Yay! I like it. My dinning room is right by my front door. No problem at all. We have a pocket door between the kitchen and dining room. Great choice! I was wondering how putting cabinets at the end of the dining room would work as a pantry…this makes so much more sense! You can have a large convenient pantry as well as a bright cheery breakfast room….converting the formal living room to dining is convenient as well as you can have a sitting area there! I like it…good idea…got to find your own way for your lifestyle! I LOVE this plan – really do! It makes sense with the house PERFECTLY and for your lives too. (I love when that happens!). If I was you (and I realize I’m not), I would wait to cut the hole in the kitchen wall until after the pantry/breakfast room is completed. That is a very NICE SIZE room you’ll end up with, I have an 8 person table in mine that size comfortably. And I have a TV in mine too, love it there, perfect for everyday dinner/tv, and for football for the family on holidays! *highfive* (maybe that’s a TX thing? ;)). But Perhaps you’ll just want to dress up that room for family gatherings once or twice a year instead of an extra dining table. Anyway…Just my thoughts. Exciting! Wish I could come help, I love this kind of $^$&! Really great solution. We have a living room and family room both with access to the “eating area”–the living room has mainly become a home office and we spend all our relaxing time in the family room. If I could redesign the house, I would not have both a living room and a family room. Many of the newer homes have the dining room in the front, so this makes perfect sense to me. What about pony walls btwn the hall and the new dining room? Give the illusion of an enclosed room? I too struggled with turning a living area into a dining room. But then a very smart blogger one day reminded me that the front door didn’t have to open up into the living area and that you should always put the rooms in your house to their best use at any given time. Now that barely used living room is a very lovely dining room with room to seat all of my family of 10. I have never looked back. I love reading your blog and can hardly wait every day for you to post. It’s like a surprise every day! I had my dining room by the front door once and it worked very well. 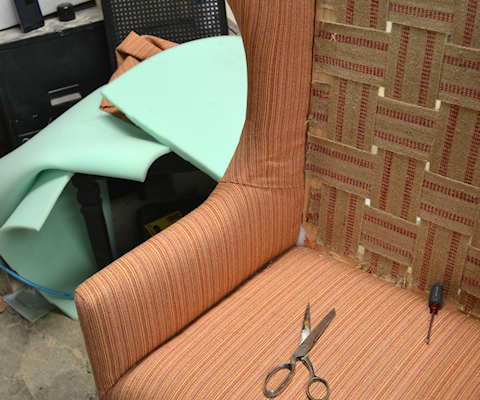 You have room to expand a little and aren’t confined to a mass of chairs. I think you will love it and I know it will be beautiful. Ps I live in Lubbock so we are fellow Texans! Maybe someone else already asked or maybe you addressed this and I missed it. But what about the beautiful fireplace in your living room? Will it stay? Is it too formal for your planned dining room space? As long as it’ll fit in there with the table and chairs, without feeling cramped, it’ll stay. I love the look of a fireplace in a dining room. This plan “feels” right. And if you should ever need a space to meet with people in the future, you have your office with its separate entrance. I’m so glad that everything is coming together for you and Matt. Your blog is my favorite, that simple. Regarding a door from the kitchen to the new DR, I wouldn’t do it. It appears that room will be used infrequently. If that’s true, I don’t think that it’s too far to walk from the kitchen through the music room to the new DR. Your kitchen is perfect. Why mess with perfection? Wow! I ALMOST suggested this, but feared you wanted a formal living room. I didn’t have the idea of a breakfast room though, and was stumped as to the space use since you already had an office. Great idea for the breakfast room, they are typically informal. I. Love. It! I love this idea for you…and I’m glad you didn’t scrap the walk in pantry. My kitchen has TONS of cabinets for storage…but I still wish there was a deep pantry with lots of shelves and only one door. You’ll use it and love it! Looks like a perfect solution to me!!! We went from family room to dining room(same space) and it works great for us! 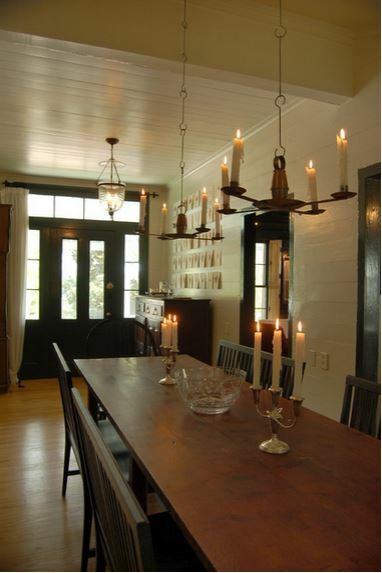 I LOVE the sight of the dining room from the front door….DR’s are always peaceful and pretty to look at! Please forgive my ignorance, what is a “breakfast room”? Will you be putting in another table and chairs? Can’t wait to see it all done! You never cease to amaze me! Love everything you’ve done!! It’s basically a dining room that’s informal, generally with a smaller table (seating four or six) that’s used quite frequently, especially in comparison to a formal dining room, which is generally used only on special occasions like holidays or large gatherings. A breakfast room is almost always located right next to the kitchen, but isn’t really part of the kitchen. If it’s located in a kitchen, it’s generally referred to as an eat-in kitchen. I love the new direction — but have one comment. Personally, I would not open up a doorway from the kitchen to your new dining room (old formal living room) UNLESS you plan on dining often. In my opinion, the few times a year that you would have to walk a little more with food would be more than made up for by not having to daily look into my kitchen. And I love the subway wall with your mom’s art, as I know you do as well. Interestingly, we have a formal dining room in this house — and I made it into a lounge. We don’t “dine,” and we don’t ever have large family gatherings as we live over a thousand miles from family (we usually have to visit them). 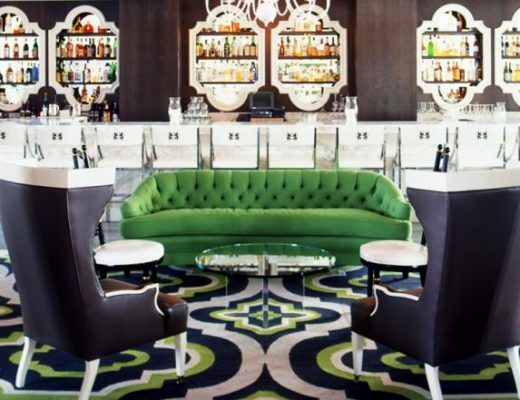 Our large informal eating area serves us well for even large gatherings with friends, as we entertain more informally. I am a big proponent of using every room in my house every single day — and the lounge gets used everyday for my reading and coffee, and my kids’ homework. Regardless, your house is YOURS and it should fit your lifestyle — both special occasion and every day. I agree with not cutting a new door. If you ever sold your house, someone else might want a door there, but I can’t see that it would be that needful for you, if you only plan to have infrequent large dinners. A door from the kitchen to the dining room is mainly to facilitate bringing in food from the kitchen and carrying food and dishes back.. When you have a large family dinner, you have many willing helpers to carry out these tasks. With our family dinners everyone takes their own dinnerware to the kitchen, so that is taken care of, too. You could try it without cutting the door first and see if you think it would be really necessary. 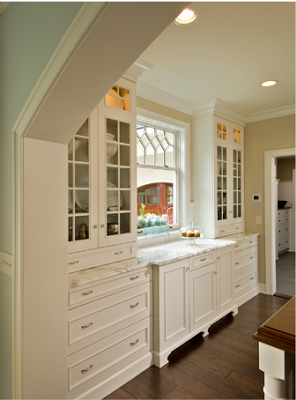 The main sight-line from the DR to your kitchen will be the beautiful wall o’ cabinets and sconces, what’s not to like? I had a pocket door installed between my DR and kitchen “so people wouldn’t see a messy kitchen,etc.” and it’s hardly ever closed, it just slows me down since I’m back and forth to the kitchen anyway when I have people over. I’ve seen some nice pictures of drapes at a doorway, that might be an option. Good job spelling Jehovah’s Witnesses correctly – I appreciate that! I love it! And I don’t think moving the dining room to the front is odd at all. We live in sort of a basic center-entry Cape. Our front door (which honestly, nobody uses) opens directly into the dining room with really no “entryway” to speak of (it was a living room in the original house). Our side door opens directly into the space between the dining room and kitchen (It’s an open floorplan with no delineating wall. The cabinetry and flooring divide the two spaces). It doesn’t look odd at all. Other than having to redo your living room again and having to tear into your beautiful tiled kitchen wall, I think you’ll be happy with your decision. I know I would be. Speaking of that kitchen wall. Three entrances into the kitchen seems a bit much to me and I think I’d miss the added wall space, even if there aren’t counters on that wall. I wonder if there’s a way to connect the rooms without actually opening a full third doorway. Maybe a service window of sorts? TOH did something a couple of years ago where they designed a set of sliding windows set at counter height to divide the kitchen off from the rest of the house. I think they used frosted antique sashes or stained glass sashes (something decorative). When they wanted the kitchen to be open for guests, they’d just slide-open the windows and it’d feel more like an open floorplan. I’ll see if I can find the photos. It’s the kind of thing that’s up your alley, might look really good next to the pony walls, and I think it’d work really well. You could open it for entertaining, maybe attach a small built-in sideboard on the dining room side for passing dishes through, but close it up most of the year and maintain the separate rooms. One question… If you are planning to use the garage for a car, where would you hang your coats in your new plan? Even in Texas, you need a coat sometimes. Just curious. Theirs is probably way bigger than would make sense in your house, I think, and you may want something semi-transparent, but you get the general idea. Okay, when I read your suggestion and tried to picture what you were talking about, I thought, “Ugh…that doesn’t sound good to me.” I’m generally not a fan of pass throughs. But I LOVE this one! It has so much character! I’m definitely filing this one away. If you want to file it away, you might want to download those screenshots. They’re in my dropbox account and I may have to remove them at some point. I think they’d also look cool as 2 hinged doors that open flat against the wall (either inside the kitchen or the dining room) instead of the bypass sliders. Think like working shutters. Or, a pair of windows where only one slides in front of the other, but that would make for a much narrower opening. I, too, love this new plan! Breakfast nooks should be more casual as they get used so frequently and the large pantry is great. I also agree with many others that you don’t need direct access to the formal dining from the kitchen, at the most a small pass thru in the wall would suffice ( and give a peek at the beautiful kitchen without seeing any messes). I love the idea of having the fireplace in the dining room, wish I could fit one in my house!! This is so exciting, and I can’t wait to see it all come together! I knew it, as I scrolled down to the photos….I had a feeling!!! Great decision! Absolutely brilliant! All the pieces just fell into place in my mind. I am so surprised!! I seriously dropped my jaw when I read your plan. And I love it!! Can’t wait to see it happen. Love the solution you came up with. What works for you and hubby is the most important factor to consider. Sure hope cutting a wall into the kitchen tiled wall works out ok, but knowing you, it will be fine and look lovely when you finish. I would not be concerned about sight lines from the dining room into the kitchen. Do you entertain the type of people who like to pretend that the lady and man of the house do no cooking themselves? Didn’t think so. Will your family be shocked at holiday dinners that there are actual used pots and baking pans in the kitchen? Didn’t think so. Over many years of entertaining I learned to plan a dinner party menu that is mostly prepared ahead of time, so I had plenty of time to make the kitchen presentable. Or we went totally informal and grilled and dined outside. To me this is a nonissue. I still wonder a bit about the garage door opening into the breakfast room, but I suppose that generally people aren’t coming and going during meals, and while that wouldn’t work well in northeastern Ohio, I can see that plan working out fine in Texas. Go for it! The new opening into the kitchen will let some great light into the kitchen from the new formal dining. Can’t wait to see it! It looks like a great solution. I’m excited too! BRILLIANT! and so very practical!! I have a dear 91 year old friend who has always said you have to live in a house for awhile before you make any major decisions…she is a very wise lady! First time commenter popping out of the woodwork to say that I think that your reimagining of your space with a breakfast room is such a cool idea! I think there’s a pervasive sense that it’s always better to have things remodeled ASAP — or at least that’s been my experience with advice out here in California — but having time to see how you & Matt used your space and what you really needed took time, and it seems like it will be completely worth it to have a solution that suits your life, instead of something that you’re *supposed* to have. Personal anecdote: My partner and I have been renovating our house over the last two years or so and the decisions we made before living in the space and seeing how it worked for us looked very nice on paper and are not so practical the reality of how we use our house. We remodeled a bathroom before we moved in — no choice, rotting subfloor, the toilet was going to fall through the floor, eek — and while it’s awesome to be sure the floor isn’t going to collapse under us, the rest of the decisions we made about the remodel would have been pretty different if we’d lived in the space beforehand. I’m so grateful that we didn’t have the budget to redo the kitchen before we moved in, like we were thinking about doing — even though it’s a ridiculous space, with the kitchen sink tucked away in what used to be a walk-in pantry and literally zero cabinets in the kitchen, the ideas we had for redoing everything would not have worked as well as the plans we’ve formed after living here for a few years. Anyway, thanks for sharing your remodeling journey and stories like these — it’s super inspiring and helpful. Isn’t it amazing that your kitchen is already designed with the empty wall between it and the current living room, so this will be so easy to do once your family room is completed. I really like that you are leaving the garage entrance right where it is for carrying in groceries, etc. And I drool over that large pantry. What I wouldn’t give for that. I’m so happy for you. I believe this design is probably the most liveable. And besides, you have your office and Matt has his game room, so why would you need both a formal living room and a family room? You know you could put another electric fireplace in the breakfast room on that garage wall, and set your tv on the mantle rather than hanging it on the wall. That’s what I did with the tv in our sunroom. We don’t have a tv in our formal living room. And if you put a door between your dining room and kitchen, use those little double doors like you did for the bathroom, that you can leave standing open. an idea if you want some separation between the 2 rooms. I LOVE IT!!! Can’t say that enough! Love the new floor plan! You’ve totally solved the wonky-ceiling concern in the breakfast room too, by putting the pantry at that end, and you get to have your freezer! Score! I think the dining room at the front will be lovely. A peek at that gorgeous kitchen when people come in the front door will just boost the Wow! factor to the next level. Can’t wait to see it all come together! YAY!! Sounds like the perfect plan! 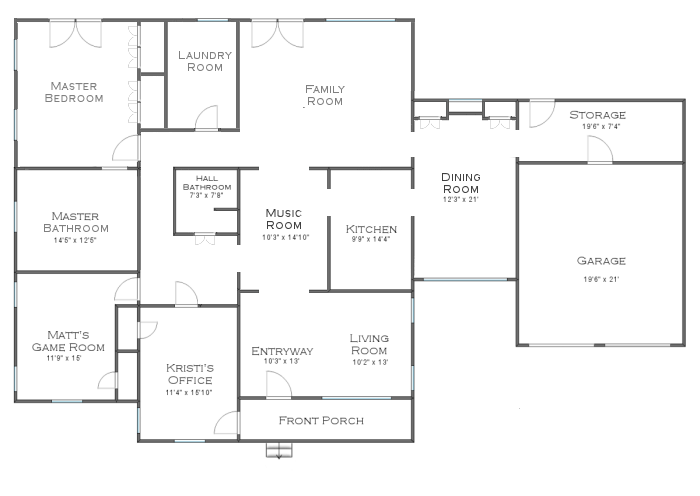 Question: what program do you use to make your fabulous floor plans?! 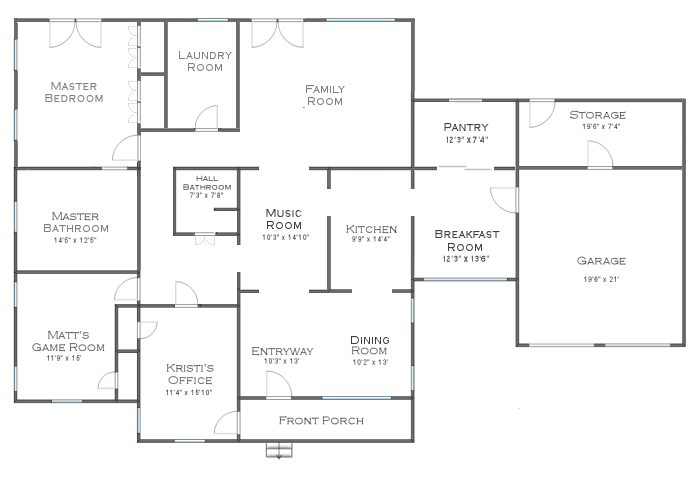 I used Roomsketcher to do the initial floor plan, but I make changes using my photo editing program Paint Shop Pro. To edit, I just do a lot of copying and pasting to make new walls, add doors, etc. I love what you’ve come up with. A lot of comments about the direct kitchen to dining room access so a couple thoughts from me. How often are you actually going to host family dinners that will require.the dining room? Is it often enough to make cutting a door in your tiled wall and loss of wall space in both rooms worthwhile? I have found pass throughs like half walls to gather more junk than be useful. I am not against the door; just wanted you to think through. Also I grew up.with having to walk through living room to dining room and for the few times a year it was used for family dinners it was not a big deal. Leaving wall intact leaves room for a beautiful sideboard to store table linens, etc.and a flat top to place desserts, punch bowl, etc. when you do use it. Our dining room is right off the front door of our house, which seemed awkward at first. We expanded the window, made great shelving where my orchids (and a Beta fish named Elvis) live. We love eating there now, we can look at beautiful orchids and enjoy the views of our front yard and gardens while we eat. I just love your new layout..We lived in our home for 10 years, all of that time it just wasn’t working for the two of us. We had a three bedroom home just over 1,200 square feet. I finally decided to take out one of the bedrooms and that became our living room. The former living room is now our dining room. The dining room is located off the front entry and it is working our perfectly. I have always heard that three bedrooms sell much better then two. However, we are retired and this is our forever home. I’m just sorry we waited so long to have our house work for us.. I also agree that l would spend some time with the new dining room before opening up the wall. Whatever you do it will be amazing. l just love your blog. Kristi..I think you nailed it!!! I like many things about this..that large master bathroom will be wonderful and convenient for your husband..you are utilizing your house in a way that works for your family..I like the idea of your dining room being to the right of your entryway…that’s exactly where mine is..with a cased opening..but we, like ya’ll are using our house in a way that works for us…we don’t need a formal dining room…we have large breakfast room and do not entertain formally..so we will use our dining room for an office/craft room…I think also..that you are still maintaining your house’s resale value by having 3 bedrooms. Or rooms that could be bedrooms if, God forbid you should ever need to sell your house..I think it’s great!! Can’t wait to see you work,your magic!!! 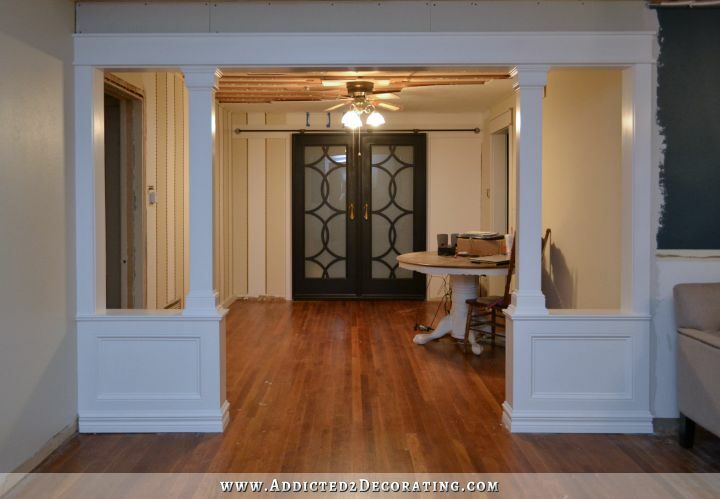 Quite a few of the new ‘modern farmhouse’ he and a couple of other architects are designing have eliminated the formal dining room by doing exactly this- putting them smack in the entry way. I did a bit I work on one that featured an oval dining table, offset form the front door, with no column or architectural feature to delineate the space, except a strategically placed chandelier. ***** I don’t know if your windows allow but built in banquet seating on one the one wall could help squeeze dining table and chairs in that space and still allow pass through. Did u ever consider switching the music room and dining room. I am not sure if that would work for you. I LOVE “watching” you think through this renovation! It is beyond fascinating and inspiring. “There are no rules” so you just keep on making rooms become what makes most sense for your family and your vision. Thank you for letting us share in your journey. I think it will look fabulous – I love that it has a fireplace there. That’s such an elegant feature in a dining room. How cozy it will be during family dinners in the wintertime! Maybe the reason that you weren’t satisfied with the decor of the living room was that the room was trying to tell you something else. Are you going to make the opening larger I to the kitchen from the now new dining? Can’t wait to see it Kristie!!!!! BRILLIANT !!!! My daugters house in Texas has the dining room to the right and the staircase and powder room to the left as you enter the house. I believe their builder was Lennair a big builder in Texas; and It always looks ‘done’, and is always clean except when everyone is there for party or festive event. The kitchen breakfast room great room and laundry pantry are at the back of the house. Great idea; I am late to the party but love this blog. I just could not figure out why your house is not more open concept, especially with your Hubs? Most people cannot tear out walls fast enough! haha Don’t get me wrong, we have a living room/dining room at the front of the house and then great room, breakfast room kitchen a mirror image in size on the back of the house. Typical 70’s ranch house!